An investigation agency's reputation is measured by its clientele. 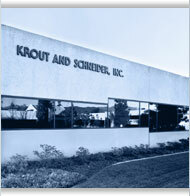 With its diverse, bilingual staff, Krout and Schneider, Inc. proudly serves major corporations, utilities, municipalities, school districts and an impressive list of law firms. Competence is necessary to be entrusted with repeat assignments, but ethics and discretion are the primary reason for our success in this profession for over seventy-five years. Operating a business today is like walking through a minefield -- it can only be done with knowledge and information. Our founders, J. Edward Krout and Sam A. Schneider, understood we must constantly adapt our services to the needs of our clients. As they often said, "No matter how long your laundry list of services, there will always be a need for something else." And they were right. Much of our work is consulting, and matching our resources to the client's problems and needs. It costs no more to use the very best. In fact, it is less expensive in the long run.